How to select a right leather watch strap for formal wear can not be ignored. Even though it’s just an accessory, it bears both functions of nice appearance and comfortable level. 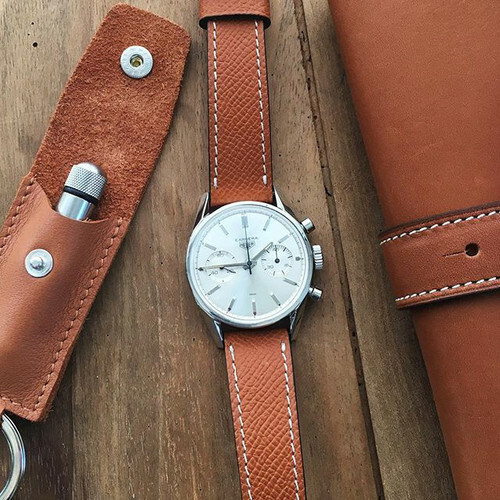 Leather watchbands are available in different materials and colors. I express my viewpoints on leather watchbands selecting, color collocation and maintenance. A smooth calfskin or cowhide watch band, common and cheap, is enough to express elegant temperament of a dress watch. A sporty watch with a calfskin watchband is also appropriate for business occasions, quiet and gentle. However, top wristwatches are seldom equipped with calfskin or cowhide watch straps. Alligator skin has been the preferred choice for top wristwatches due to cherish rarity, unique patterns and powerful temperament. An alligator isn’t so large as others, so a whole piece of alligator skin is cut into five watch straps at most. The alligator is mainly farmed. The top-grade leather shoes and belts are made of its back skin. The chest and stomach skin with standard rectangle patterns is the best choice for top watch straps. The tail skin with longer patterns is the second choice for watchbands. In generally, an alligator watchband is sold at $ 350-850. Some pass calfskin printed with alligator patterns off as real alligator skin, but fake products never go real. If two alligator watchbands have the same patterns, either of them must be fake because patterns on the alligator grow naturally. There are no two pieces of alligator skin which are the same in the world. Lizard skin, ostrich skin and stingray skin are rarer than alligator skin. Although those animal skins are not necessarily more expensive than alligator skin, those stands out wearers’ personal charm. Lizard skin watch strap with octangle patterns fits wrists more softly than alligator skin watchband. What’s more, its price is lower than that of alligator skin. Ostrich skin features large pores that left after its feathers were removed. The lizard watch strap is enough to make a young boy into a strong man or a superman. Stingray skin is the most distinctive of many animal skins, due to rugged grains. Masters find that stingray skin with diamonds is very beautiful and luxury, so many jewelry watches are equipped with stingray skin watch straps. 1. Let leather watch straps soaked with sweat dry out in the wind, and the straps are easy to crack and give off bad smell. The best way is to dry straps with wet cloth immediately. You had better wear metal watch bracelets in the hot weather. 2. Careful care can’t stop leather watch strap to get old. Generally speaking, to replace a watchband is necessary every two years at least.